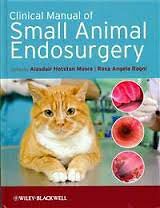 A practical and comprehensive guide to rigid endoscopy and endosurgery in small animal practice. Fully illustrated throughout, it covers the clinical treatment of small animals from pre-operative through to post-operative care. With reference to specific procedures, this manual includes guidance on the selection of equipment, surgical techniques, anaesthesia and possible complications. A specialist chapter advising on the treatment of birds, reptiles and small mammals is also included. Clinical Manual of Small Animal Endosurgery will enable veterinarians to develop and improve their endoscopic techniques in clinical practice, as well as providing guidance on referral options for more complex cases.  Provides comprehensive information on how to perform rigid endoscopic investigations and procedures.